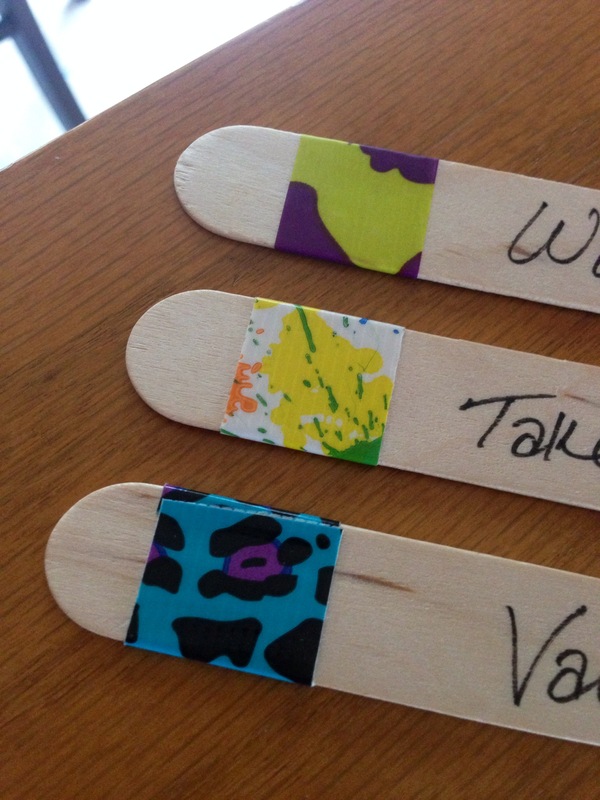 Craftstravaganza: Washi Tape Chore Sticks! In case y’all didn’t know, my fiance is the father of three of the most hilarious boys I’ve ever met in my life. Even though they try me sometimes, these kids truly bring joy to my life; I always look forward to hearing their crazy stories and watching them laugh and play. Since they don’t stay with us full-time, I have been searching for ways to get them more involved in the daily routine at our house. A couple of weeks ago I mentioned the idea of getting paid to do work around the house and they were really excited about it, so I did what I always do in situations like these–logged into Pinterest to search for inspiration. This is where I got the idea of creating chore sticks. Not only was this craft super easy, it was also pretty cheap–I got all of the supplies for under $10! I started by applying tape to the end of each stick so that each boy would know which chores were his to complete. I thought this would be easier than writing their names on the sticks. Also, it makes the sticks more colorful and fun! Washi tape makes doing chores cool. Once I had all the sticks taped–I ended up with 20 per kid–I started on the hardest part of the project, which was determining which chores to put on the sticks. 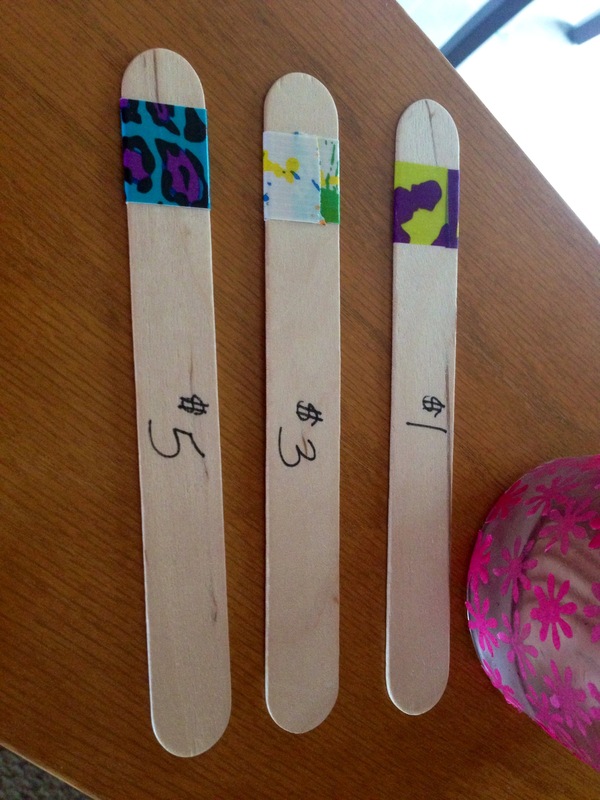 I researched age-appropriate chores for an 8, 7, and 4-year old and wrote one chore on the front of each stick. I decided to write out the chores and not use pictures for a number of reasons: (1) it was easier for me; (2) it gave the older two boys a chance to practice their reading; and (3) it gave the youngest boy a chance to start recognizing letters and words, even though he can’t read yet. Some of the chores were simple, like clearing the table. Others were more complicated or time-consuming, like vacuuming the stairs or sweeping the garage and driveway. 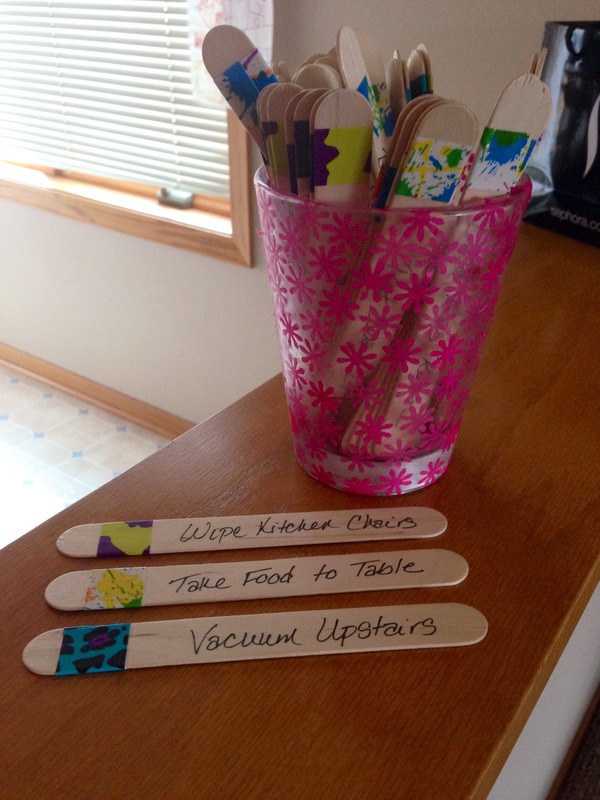 Each chore was priced at either $1, $3, or $5; I wrote the price on the back of each stick. Once they completed a chore, they were allowed to flip the stick over and see how much money they earned. You can easily add new chores by purchasing more sticks and “swap” sticks by changing the tape. If the middle boy outgrows a chore, all I have to do is change the tape and it becomes a chore for the youngest. After I made the sticks, I sat the boys down and explained how the process would work. Each day they were at our house, they would receive a chore stick (sometimes multiple chore sticks). It was their responsibility to complete the chores before they left to go back to their mom’s house. In order to be compensated for their chore, it had to pass inspection–either JB or I had to check their work to make sure it was good. If not, they would not get their money. Additionally, they could lose money if they misbehaved throughout the week–not listening, being disrespectful, fighting, etc. might cause them to lose a dollar. Once they completed all their chores for the day, I would pay them their money. Each boy has two baggies–one labeled “spend” and the other “save.” They could decide how much money they wanted to save (for a big item like a video game or a tablet) and how much to put aside to spend at the end of the week. Not only did I get to flex my underused craft muscle, I also got a bunch of help around the house for wayyyyyyyy less than the cost of a housekeeper. It may have taken a bit longer to get things done, but the boys need to learn how to take care of a household so I consider taking the extra time in the short-term as a long-term investment in them–as they continue to complete the chores they will only get better at them. Also, having the boys complete smaller tasks freed me up to complete some of the larger ones, so everyone wins! I’ll keep y’all updated on our progress as we continue to use these. You can also find my original inspiration for this craft (as well as the list of age-appropriate chores I drew from) on my Pinterest page. Happy crafting!